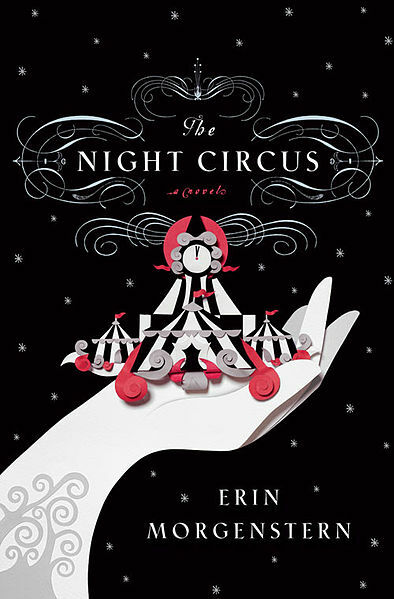 I just finished reading Erin Morgenstern’s debut novel, The Night Circus, and I enjoyed it quite a bit. The book was my spring break diversion. I don’t read much contemporary fiction, usually opting for early-twentieth-century British novels when I have the time, and The Night Circus was a nice change of pace. The novel is also a romance. “Spell-binding” love is one of those magical realities that the magicians end up dealing with. It’s a night circus. Magical things happen at night. At night doves appear out of thin air and people disappear without a trace. At night love also blooms and grows. Morgenstern attempts to give the whole book a certain dreamlike quality by narrating in the present tense (which I found a bit distracting at first, but I got over it). The book is also sprinkled with occasional vignettes written in the second person. I know these passages were meant to reinforce the dreamlike quality, but I don’t think they were wholly successful. Second-person narrative seems pretentious and awkward. It reminds me a bit of those choose-your-own-adventure books that I read in middle school. I’m forgiving the book for this minor lapse because it still delighted me. In short, I had always believed that the world involved magic: now I thought that perhaps it involved a magician. And this pointed a profound emotion always present and subconscious; that this world of ours has some purpose; and if there is a purpose, there is a person. I had always felt life as a story: and if there is a story there is a storyteller. The night circus is a microcosm of the world. Most of us wander through life being awed by it, but never understanding just how magical a place it is. The circus has a purpose that only tangentially involves its guests. Moreover, we tell stories everyday, but we don’t notice the master narrative of life. This novel deals with all these ideas: life is a story set in a magical world and has a purpose. And the novel’s about love. Who doesn’t like a love story? This novel reminds me of Susanna Clarke’s Jonathan Strange & Mr Norrell, which imagines magic returning to early-nineteenth-century England. Clarke’s novel also investigates these same themes from Chesterton. On the whole, Jonathan Strange & Mr Norrell is a better novel than The Night Circus, but The Night Circus is a little more accessible. Both are worth reading if you enjoy the fantastical. If you’ve read these books or others like them, let me know what you think in the comments section. But please no spoilers. Couldn’t agree more! I think the book excelled within the circus, and the fantastical descriptions. I don’t think it necessarily had the depth and development to do justice to the rest of the story, and some of the characters weren’t fully explored. A bit of a frustrating one to review. On one level it is so good, yet on another it is a little deflating. I really enjoyed it though, and it’s one I would read again. It’s the intricate descriptions and imagination that trumps this one from the rest in this genre. Loved it. I just wanted to find out what happened to Bailey. There’s a sequel in the making. Or so I heard.